I'm currently planning a new Space topic for S1, as part of my department's CfE development. I'd like to do something on sustaining life in space, looking at providing space travelers with clean air, clean water, food and communications during various types of missions. I've yet to decide on a format for the unit, but I'm aiming to do a rich task with the pupils planning how to provide for each need on four different types of mission - Earth orbit, Lunar habitation, Interplanetary travel (e.g. Earth - Mars) and Mars habitation. There's not a great deal of scope for practical in most Space topics, and this is a great opportunity to do some cross curricular work in science - it ties together some biology, chemistry and physics. I'd like to do some practical to demonstrate some main points - O2 production/CO2 removal by photosynthesis and chemical 'scrubbing', hydroponic plant growth, water purification and signal delay. ALBA interfacing gas sensors can be used to show CO2 and O2 levels in real time for photosynthesis in plants - link. Using that experiment as a starting point, this is a bit of kit I'm thinking of putting together to demonstrate the CO2 and O2 content of 'fresh' air, exhaled air and 'scrubbed' air (using LiOH or similar to remove CO2 from exhaled air). Clean air - with the exit valve closed, pump air from the room into the container, inflating the bag, whilst the sensors display the CO2 and O2 levels. 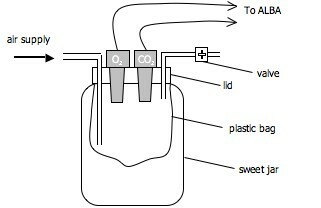 Exhaled air - with the exit valve closed, use air from balloons inflated by mouth to inflate the bag, whilst the sensors display the CO2 and O2 levels. Scrubbed air - with the exit valve closed and some LiOH in the bottom of the bag, use air from balloons inflated by mouth to inflate the bag, whilst the sensors display the CO2 and O2 levels. I'm expecting there to be some problems with this, but would very much appreciate some constructive criticism from the Physics/Science community. Suggestions regarding safety concerns, possible pitfalls, or just better alternatives would be gratefully received. Please click on 'Leave a Reply' below to add your thoughts. On advice of Graham Dane, from St Augustine's in Edinburgh, who responded to a posting on SPUTNIK (Scottish Physics teachers' email forum), I've had a rethink about the third demo. Rather than have LiOH pellets in the bag to scrub the oxygen, a separate piece of apparatus will be used as a CO2 scrubber, before the sampling jar. I've got this made already, but can't test it until we can source a suitable jar to house the sensing part of the experiment, above. Graham also pointed out that removing the CO2 would affect photosynthesis, so I might well have a fourth demo to take a stab at.